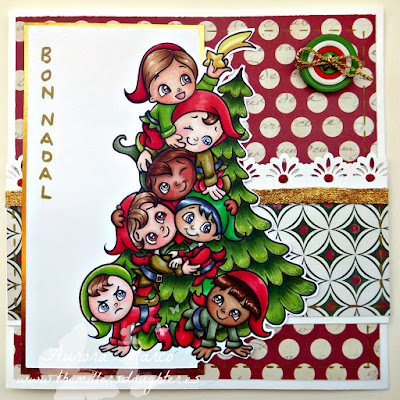 Back today with a new card for Copic Spain and taking the chance to wish you all Merry Christmas! Hope to see you all in the New Year!! All colouring details to be found here (includes many skin combos). Crafting by Designs- Here Come the Holidays! What a pile of cute elves. Thankyou for sharing your card with us at Crafting From The Heart. hugs ValeryAnne D.T. Super cute and festive...thanks for joining us at Crafty Gals Corner. Super funny. I love these elves. I wish you a merry christmas. Hugs. An adorable card!!! Thanks so much for participating in our LEMON SHORTBREAD challenge!!! Can’t wait to see you participate again in our challenge in the new year!! Fantastic work Aurora! Love the image - so much Christmas joy! Thank you for joining us at Copic Sweden this month!